Why, do I play the bagpipes? I blame my family. Not all of them, but enough of them unknowingly conspired across a century or more to put me where I am and have you reading this. My great-great grandfather, Thomas Bryan, was a Band-Sergeant in the British 96th Regiment and played at the Coronation of Queen Victoria. After leaving the Army, he sailed from England to Western Australia with his wife, Deborah, on the Glasgow-built Clyde as a Pensioner Guard of the convicts on-board. The Bryans arrived in Fremantle on May 29th, 1863 and settled there. Thomas was active as a musician and ran fundraising concerts. A playbill from one of his concerts is one of my most prized possessions. Thomas and Deborah moved to Tasmania in 1879 and Thomas was appointed as Bandmaster at St Joseph’s Band in Launceston. One of their children, Patrick, was a trombonist in the Launceston City Band for 47 years and all of Patrick’s children were musicians in some form or another. The youngest daughter, Laurie (my grandmother), was a piano teacher in Launceston and, well into her 90s, would have children in her local street seated at the piano in her front room. It was her mother’s piano and now mine. I even have the receipt from its date of purchase in 1914. 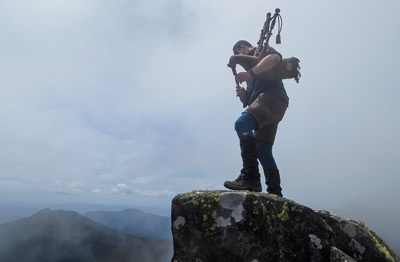 Playing music seemed to pass my father by, but it might have been because he only expressed to his mother an interest in playing one instrument the bagpipes! And she was having none of that. My brother and I learnt a love of two things from our grandmother: playing music and eating biscuits. Probably in equal amounts. Then, my brother turned his attention to a girl who was not only a tenor drummer in Launceston’s St Andrews Caledonian Pipe Band, but the Drum Major’s daughter. So, he joined the band and played the side drum for a while. As parents do, if one kid was going to the band, both kids were going and I learnt the bagpipes. I’ve been there for over 25 years now and have been the Pipe Major for 16 of those. In that role, I’ve created the band’s fundraising concerts Celtic Force, Scottish Power and Here’s to the Heroes. Funds raised from these events has seen St Andrews Caledonian Pipe Band perform concert tours in Scotland, Ireland and Northern Ireland and compete at two World Pipe Band Championships in Glasgow where the Clyde was built in 1860. I hope Thomas Bryan would approve. About 20 years ago, I had an opportunity to join a local Irish rock band. All I had to do was learn the tin whistle. With that done, I’ve had the opportunity to play some fantastic gigs locally and interstate and the whistle became a very solid second string instrument and became a handy item to carry in several tours to Ireland. 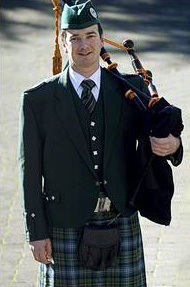 Whilst born and bred in Launceston, Tasmania, these experiences have led me to perform with other pipe bands nationally and internationally including another two World Pipe Band Championship appearances, two Edinburgh Military Tattoos in Australia, a Basel International Tattoo, Andre Rieu’s World Stadium Tour, Festival Interceltique de Lorient and solo performances across the world including weddings at Edinburgh Castle, on the sand in Fiji and among the lights of Las Vegas. Music is my passion and my heritage. I play music because I can and because I couldn’t imagine not doing it. It’s just in me to do.